Protesters call for an increased minimum wage as part of the "Fight for $15" effort to require a $15 per hour minimum wage in 2015. A minimum wage is the lowest remuneration that employers can legally pay their workers—the price floor below which workers may not sell their labor. Most countries had introduced minimum wage legislation by the end of the 20th century. Supply and demand models suggest that there may be welfare and employment losses from minimum wages. However, if the labor market is in a state of monopsony (with only one employer available who is hiring), minimum wages can increase the efficiency of the market. There is debate about the effect of minimum wages. The movement for minimum wages was first motivated as a way to stop the exploitation of workers in sweatshops, by employers who were thought to have unfair bargaining power over them. Over time, minimum wages came to be seen as a way to help lower-income families. Although minimum wage laws are in effect in many jurisdictions, differences of opinion exist about the benefits and drawbacks of a minimum wage. Supporters of the minimum wage say it increases the standard of living of workers, reduces poverty, reduces inequality, and boosts morale. In contrast, opponents of the minimum wage say it increases poverty, increases unemployment (particularly among unskilled or inexperienced workers) and is damaging to businesses, because excessively high minimum wages require businesses to raise the prices of their product or service to accommodate the extra expense of paying a higher wage and some low-wage workers "will be unable to find work...[and] will be pushed into the ranks of the unemployed." Modern national laws enforcing compulsory union membership which prescribed minimum wages for their members were first passed in New Zealand and Australia in the 1890s. "It is a serious national evil that any class of his Majesty's subjects should receive less than a living wage in return for their utmost exertions. It was formerly supposed that the working of the laws of supply and demand would naturally regulate or eliminate that evil [...and...] ultimately produce a fair price. Where... you have a powerful organisation on both sides... there you have a healthy bargaining.... But where you have what we call sweated trades, you have no organisation, no parity of bargaining, the good employer is undercut by the bad, and the bad employer is undercut by the worst... where those conditions prevail you have not a condition of progress, but a condition of progressive degeneration." Modern minimum wage laws trace their origin to the Ordinance of Labourers (1349), which was a decree by King Edward III that set a maximum wage for laborers in medieval England. King Edward III, who was a wealthy landowner, was dependent, like his lords, on serfs to work the land. In the autumn of 1348, the Black Plague reached England and decimated the population. The severe shortage of labor caused wages to soar and encouraged King Edward III to set a wage ceiling. Subsequent amendments to the ordinance, such as the Statute of Labourers (1351), increased the penalties for paying a wage above the set rates. While the laws governing wages initially set a ceiling on compensation, they were eventually used to set a living wage. An amendment to the Statute of Labourers in 1389 effectively fixed wages to the price of food. As time passed, the Justice of the Peace, who was charged with setting the maximum wage, also began to set formal minimum wages. The practice was eventually formalized with the passage of the Act Fixing a Minimum Wage in 1604 by King James I for workers in the textile industry. By the early 19th century, the Statutes of Labourers was repealed as increasingly capitalistic England embraced laissez-faire policies which disfavored regulations of wages (whether upper or lower limits). The subsequent 19th century saw significant labor unrest affect many industrial nations. As trade unions were decriminalized during the century, attempts to control wages through collective agreement were made. However, this meant that a uniform minimum wage was not possible. In Principles of Political Economy in 1848, John Stuart Mill argued that because of the collective action problems that workers faced in organisation, it was a justified departure from laissez-faire policies (or freedom of contract) to regulate people's wages and hours by the law. It was not until the 1890s that the first modern legislative attempts to regulate minimum wages were seen in New Zealand and Australia. The movement for a minimum wage was initially focused on stopping sweatshop labor and controlling the proliferation of sweatshops in manufacturing industries. The sweatshops employed large numbers of women and young workers, paying them what were considered to be substandard wages. The sweatshop owners were thought to have unfair bargaining power over their employees, and a minimum wage was proposed as a means to make them pay fairly. Over time, the focus changed to helping people, especially families, become more self-sufficient. Hourly minimum wages in select developed economies in 2013. For a complete list of global wages see: List of minimum wages by country. Wages are given in US$ exchange rates. The first modern national minimum wages were enacted by the government recognition of unions which in turn established minimum wage policy among their members, as in New Zealand in 1894, followed by Australia in 1896 and the United Kingdom in 1909. In the United States, statutory minimum wages were first introduced nationally in 1938, and they were reintroduced and expanded in the United Kingdom in 1998. There is now legislation or binding collective bargaining regarding minimum wage in more than 90 percent of all countries. In the European Union, 22 member states out of 28 currently have national minimum wages. Other countries, such as Sweden, Finland, Denmark, Switzerland, Austria, and Italy, have no minimum wage laws, but rely on employer groups and trade unions to set minimum earnings through collective bargaining. Minimum wage rates vary greatly across many different jurisdictions, not only in setting a particular amount of money—for example $7.25 per hour ($14,500 per year) under certain US state laws (or $2.13 for employees who receive tips, which is known as the tipped minimum wage), $11.00 in the US state of Washington, or £7.83 (for those aged 25+) in the United Kingdom—but also in terms of which pay period (for example Russia and China set monthly minimum wages) or the scope of coverage. Currently the United States federal minimum wage is $7.25 per hour. However, some states do not recognize the minimum wage law, such as Louisiana and Tennessee. Other states operate below the federal minimum wage such as Georgia and Wyoming. Some jurisdictions allow employers to count tips given to their workers as credit towards the minimum wage levels. India was one of the first developing countries to introduce minimum wage policy in its law in 1948. However, it is rarely implemented, even by contractors of government agencies. In Mumbai, as of 2017, the minimum wage was Rs. 348/day. India also has one of the most complicated systems with more than 1,200 minimum wage rates depending on the geographical region. Customs and extra-legal pressures from governments or labor unions can produce a de facto minimum wage. So can international public opinion, by pressuring multinational companies to pay Third World workers wages usually found in more industrialized countries. The latter situation in Southeast Asia and Latin America was publicized in the 2000s, but it existed with companies in West Africa in the middle of the 20th century. Among the indicators that might be used to establish an initial minimum wage rate are ones that minimize the loss of jobs while preserving international competitiveness. Among these are general economic conditions as measured by real and nominal gross domestic product; inflation; labor supply and demand; wage levels, distribution and differentials; employment terms; productivity growth; labor costs; business operating costs; the number and trend of bankruptcies; economic freedom rankings; standards of living and the prevailing average wage rate. In the business sector, concerns include the expected increased cost of doing business, threats to profitability, rising levels of unemployment (and subsequent higher government expenditure on welfare benefits raising tax rates), and the possible knock-on effects to the wages of more experienced workers who might already be earning the new statutory minimum wage, or slightly more. Among workers and their representatives, political considerations weigh in as labor leaders seek to win support by demanding the highest possible rate. Other concerns include purchasing power, inflation indexing and standardized working hours. In the United States, the minimum wage have been set under the Fair Labor Standards Act of 1938. According to the Economic Policy Institute, the minimum wage in the United States would have been $18.28 in 2013 if the minimum wage had kept pace with labor productivity. To adjust for increased rates of worker productivity in the United States, raising the minimum wage to $22 (or more) an hour has been presented. Graph showing the basic supply and demand model of the minimum wage in the labor market. If a higher minimum wage increases the wage rates of unskilled workers above the level that would be established by market forces, the quantity of unskilled workers employed will fall. The minimum wage will price the services of the least productive (and therefore lowest-wage) workers out of the market. … the direct results of minimum wage legislation are clearly mixed. Some workers, most likely those whose previous wages were closest to the minimum, will enjoy higher wages. Others, particularly those with the lowest prelegislation wage rates, will be unable to find work. They will be pushed into the ranks of the unemployed. A firm's cost is an increasing function of the wage rate. The higher the wage rate, the fewer hours an employer will demand of employees. This is because, as the wage rate rises, it becomes more expensive for firms to hire workers and so firms hire fewer workers (or hire them for fewer hours). The demand of labor curve is therefore shown as a line moving down and to the right. Since higher wages increase the quantity supplied, the supply of labor curve is upward sloping, and is shown as a line moving up and to the right. If no minimum wage is in place, wages will adjust until quantity of labor demanded is equal to quantity supplied, reaching equilibrium, where the supply and demand curves intersect. Minimum wage behaves as a classical price floor on labor. Standard theory says that, if set above the equilibrium price, more labor will be willing to be provided by workers than will be demanded by employers, creating a surplus of labor, i.e. unemployment. The economic model of markets predicts the same of other commodities (like milk and wheat, for example): Artificially raising the price of the commodity tends to cause an increase in quantity supplied and a decrease in quantity demanded. The result is a surplus of the commodity. When there is a wheat surplus, the government buys it. Since the government does not hire surplus labor, the labor surplus takes the form of unemployment, which tends to be higher with minimum wage laws than without them. The supply and demand model implies that by mandating a price floor above the equilibrium wage, minimum wage laws will cause unemployment. This is because a greater number of people are willing to work at the higher wage while a smaller number of jobs will be available at the higher wage. Companies can be more selective in those whom they employ thus the least skilled and least experienced will typically be excluded. An imposition or increase of a minimum wage will generally only affect employment in the low-skill labor market, as the equilibrium wage is already at or below the minimum wage, whereas in higher skill labor markets the equilibrium wage is too high for a change in minimum wage to affect employment. 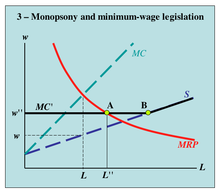 Modern economics suggests that a moderate minimum wage may increase employment as labor markets are monopsonistic and workers lack bargaining power. The supply and demand model predicts that raising the minimum wage helps workers whose wages are raised, and hurts people who are not hired (or lose their jobs) when companies cut back on employment. But proponents of the minimum wage hold that the situation is much more complicated than the model can account for. One complicating factor is possible monopsony in the labor market, whereby the individual employer has some market power in determining wages paid. Thus it is at least theoretically possible that the minimum wage may boost employment. Though single employer market power is unlikely to exist in most labor markets in the sense of the traditional 'company town,' asymmetric information, imperfect mobility, and the personal element of the labor transaction give some degree of wage-setting power to most firms. Modern economic theory predicts that although an excessive minimum wage may raise unemployment as it fixes a price above most demand for labor, a minimum wage at a more reasonable level can increase employment, and enhance growth and efficiency. This is because labor markets are monopsonistic and workers persistently lack bargaining power. When poorer workers have more to spend it stimulates effective aggregate demand for goods and services. The argument that a minimum wage decreases employment is based on a simple supply and demand model of the labor market. A number of economists (for example Pierangelo Garegnani, Robert L. Vienneau, and Arrigo Opocher & Ian Steedman), building on the work of Piero Sraffa, argue that that model, even given all its assumptions, is logically incoherent. Michael Anyadike-Danes and Wynne Godley argue, based on simulation results, that little of the empirical work done with the textbook model constitutes a potentially falsifiable theory, and consequently empirical evidence hardly exists for that model. Graham White argues, partially on the basis of Sraffianism, that the policy of increased labor market flexibility, including the reduction of minimum wages, does not have an "intellectually coherent" argument in economic theory. Minimum wage levels in OECD countries as a share of average full-time wage, 2013. Gary Fields, Professor of Labor Economics and Economics at Cornell University, argues that the standard textbook model for the minimum wage is ambiguous, and that the standard theoretical arguments incorrectly measure only a one-sector market. Fields says a two-sector market, where "the self-employed, service workers, and farm workers are typically excluded from minimum-wage coverage... [and with] one sector with minimum-wage coverage and the other without it [and possible mobility between the two]," is the basis for better analysis. Through this model, Fields shows the typical theoretical argument to be ambiguous and says "the predictions derived from the textbook model definitely do not carry over to the two-sector case. Therefore, since a non-covered sector exists nearly everywhere, the predictions of the textbook model simply cannot be relied on." An alternate view of the labor market has low-wage labor markets characterized as monopsonistic competition wherein buyers (employers) have significantly more market power than do sellers (workers). This monopsony could be a result of intentional collusion between employers, or naturalistic factors such as segmented markets, search costs, information costs, imperfect mobility and the personal element of labor markets. In such a case a simple supply and demand graph would not yield the quantity of labor clearing and the wage rate. This is because while the upward sloping aggregate labor supply would remain unchanged, instead of using the upward labor supply curve shown in a supply and demand diagram, monopsonistic employers would use a steeper upward sloping curve corresponding to marginal expenditures to yield the intersection with the supply curve resulting in a wage rate lower than would be the case under competition. Also, the amount of labor sold would also be lower than the competitive optimal allocation. Such a case is a type of market failure and results in workers being paid less than their marginal value. Under the monopsonistic assumption, an appropriately set minimum wage could increase both wages and employment, with the optimal level being equal to the marginal product of labor. This view emphasizes the role of minimum wages as a market regulation policy akin to antitrust policies, as opposed to an illusory "free lunch" for low-wage workers. Another reason minimum wage may not affect employment in certain industries is that the demand for the product the employees produce is highly inelastic. For example, if management is forced to increase wages, management can pass on the increase in wage to consumers in the form of higher prices. Since demand for the product is highly inelastic, consumers continue to buy the product at the higher price and so the manager is not forced to lay off workers. Economist Paul Krugman argues this explanation neglects to explain why the firm was not charging this higher price absent the minimum wage. Three other possible reasons minimum wages do not affect employment were suggested by Alan Blinder: higher wages may reduce turnover, and hence training costs; raising the minimum wage may "render moot" the potential problem of recruiting workers at a higher wage than current workers; and minimum wage workers might represent such a small proportion of a business's cost that the increase is too small to matter. He admits that he does not know if these are correct, but argues that "the list demonstrates that one can accept the new empirical findings and still be a card-carrying economist." Estimated minimum wage effects on employment from a meta-study of 64 other studies showed insignificant employment effect (both practically and statistically) from minimum-wage raises. The most precise estimates were heavily clustered at or near zero employment effects (elasticity = 0). Economists disagree as to the measurable impact of minimum wages in practice. This disagreement usually takes the form of competing empirical tests of the elasticities of supply and demand in labor markets and the degree to which markets differ from the efficiency that models of perfect competition predict. Until the mid-1990s, a general consensus existed among economists, both conservative and liberal, that the minimum wage reduced employment, especially among younger and low-skill workers. In addition to the basic supply-demand intuition, there were a number of empirical studies that supported this view. For example, Gramlich (1976) found that many of the benefits went to higher income families, and that teenagers were made worse off by the unemployment associated with the minimum wage. Brown et al. (1983) noted that time series studies to that point had found that for a 10 percent increase in the minimum wage, there was a decrease in teenage employment of 1–3 percent. However, the studies found wider variation, from 0 to over 3 percent, in their estimates for the effect on teenage unemployment (teenagers without a job and looking for one). In contrast to the simple supply and demand diagram, it was commonly found that teenagers withdrew from the labor force in response to the minimum wage, which produced the possibility of equal reductions in the supply as well as the demand for labor at a higher minimum wage and hence no impact on the unemployment rate. Using a variety of specifications of the employment and unemployment equations (using ordinary least squares vs. generalized least squares regression procedures, and linear vs. logarithmic specifications), they found that a 10 percent increase in the minimum wage caused a 1 percent decrease in teenage employment, and no change in the teenage unemployment rate. The study also found a small, but statistically significant, increase in unemployment for adults aged 20–24. Wellington (1991) updated Brown et al. 's research with data through 1986 to provide new estimates encompassing a period when the real (i.e., inflation-adjusted) value of the minimum wage was declining, because it had not increased since 1981. She found that a 10% increase in the minimum wage decreased the absolute teenage employment by 0.6%, with no effect on the teen or young adult unemployment rates. Some research suggests that the unemployment effects of small minimum wage increases are dominated by other factors. In Florida, where voters approved an increase in 2004, a follow-up comprehensive study after the increase confirmed a strong economy with increased employment above previous years in Florida and better than in the US as a whole. When it comes to on-the-job training, some believe the increase in wages is taken out of training expenses. A 2001 empirical study found that there is "no evidence that minimum wages reduce training, and little evidence that they tend to increase training." Some empirical studies have tried to ascertain the benefits of a minimum wage beyond employment effects. In an analysis of census data, Joseph Sabia and Robert Nielson found no statistically significant evidence that minimum wage increases helped reduce financial, housing, health, or food insecurity. This study was undertaken by the Employment Policies Institute, a think tank funded by the food, beverage and hospitality industries. In 2012, Michael Reich published an economic analysis that suggested that a proposed minimum wage hike in San Diego might stimulate the city's economy by about $190 million. The Economist wrote in December 2013: "A minimum wage, providing it is not set too high, could thus boost pay with no ill effects on jobs....America's federal minimum wage, at 38% of median income, is one of the rich world's lowest. Some studies find no harm to employment from federal or state minimum wages, others see a small one, but none finds any serious damage. ... High minimum wages, however, particularly in rigid labour markets, do appear to hit employment. France has the rich world’s highest wage floor, at more than 60% of the median for adults and a far bigger fraction of the typical wage for the young. This helps explain why France also has shockingly high rates of youth unemployment: 26% for 15- to 24-year-olds." The restaurant industry is commonly studied because of its high number of minimum wage workers. A 2018 study from the Center on Wage and Employment Dynamics at the University of California, Berkeley focusing on food services showed that minimum wage increases in Washington, Chicago, Seattle, San Francisco, Oakland, and San Jose gave workers higher pay without hampering job growth. A 2017 study of restaurants in the San Francisco Bay Area examined the period 2008-2016 and the effect that a minimum wage increase had on the probability of restaurants going out of business, and broke out results based on the restaurant's rating on the review site Yelp. The study found no effect for 5-star (highest rated) restaurants (regardless of the expensiveness of the cuisine) but those with increasingly lower ratings were increasingly likely to go out of business (for example a 14% increase at 3.5 stars for a $1 per hour minimum wage increase). It also noted that the Yelp star rating was correlated with likelihood of minority ownership and minority customer base. Importantly, it noted that restaurants below 4 star in rating were proportionally more likely to higher low-skilled workers. The minimum wage increases during this period did not prevent growth in the industry overall – the number of restaurants in San Francisco went from 3,600 in 2012 to 7,600 in 2016. In 1992, the minimum wage in New Jersey increased from $4.25 to $5.05 per hour (an 18.8% increase), while in the adjacent state of Pennsylvania it remained at $4.25. David Card and Alan Krueger gathered information on fast food restaurants in New Jersey and eastern Pennsylvania in an attempt to see what effect this increase had on employment within New Jersey. A basic supply and demand model predicts that relative employment should have decreased in New Jersey. Card and Krueger surveyed employers before the April 1992 New Jersey increase, and again in November–December 1992, asking managers for data on the full-time equivalent staff level of their restaurants both times. Based on data from the employers' responses, the authors concluded that the increase in the minimum wage slightly increased employment in the New Jersey restaurants. Card and Krueger expanded on this initial article in their 1995 book Myth and Measurement: The New Economics of the Minimum Wage. They argued that the negative employment effects of minimum wage laws are minimal if not non-existent. For example, they look at the 1992 increase in New Jersey's minimum wage, the 1988 rise in California's minimum wage, and the 1990–91 increases in the federal minimum wage. In addition to their own findings, they reanalyzed earlier studies with updated data, generally finding that the older results of a negative employment effect did not hold up in the larger datasets. A 2010 study published in the Review of Economics and Statistics compared 288 pairs of contiguous U.S. counties with minimum wage differentials from 1990 to 2006 and found no adverse employment effects from a minimum wage increase. Contiguous counties with different minimum wages are in purple. All other counties are in white. In 1996, David Neumark and William Wascher reexamined Card and Krueger's result using administrative payroll records from a sample of large fast food restaurant chains, and reported that minimum wage increases were followed by decreases in employment. An assessment of data collected and analyzed by Neumark and Wascher did not initially contradict the Card and Krueger results, but in a later edited version they found a four percent decrease in employment, and reported that "the estimated disemployment effects in the payroll data are often statistically significant at the 5- or 10-percent level although there are some estimators and subsamples that yield insignificant—although almost always negative" employment effects. Neumark and Wascher's conclusions were subsequently rebutted in a 2000 paper by Card and Krueger. A 2011 paper has reconciled the difference between Card and Krueger's survey data and Neumark and Wascher's payroll-based data. The paper shows that both datasets evidence conditional employment effects that are positive for small restaurants, but are negative for large fast-food restaurants. A 2014 analysis based on panel data found that the minimum wage reduces employment among teenagers. In 1996 and 1997, the federal minimum wage was increased from $4.25 to $5.15, thereby increasing the minimum wage by $0.90 in Pennsylvania but by just $0.10 in New Jersey; this allowed for an examination of the effects of minimum wage increases in the same area, subsequent to the 1992 change studied by Card and Krueger. A study by Hoffman and Trace found the result anticipated by traditional theory: a detrimental effect on employment. Further application of the methodology used by Card and Krueger by other researchers yielded results similar to their original findings, across additional data sets. A 2010 study by three economists (Arindrajit Dube of the University of Massachusetts Amherst, William Lester of the University of North Carolina at Chapel Hill, and Michael Reich of the University of California, Berkeley), compared adjacent counties in different states where the minimum wage had been raised in one of the states. They analyzed employment trends for several categories of low-wage workers from 1990 to 2006 and found that increases in minimum wages had no negative effects on low-wage employment and successfully increased the income of workers in food services and retail employment, as well as the narrower category of workers in restaurants. However, a 2011 study by Baskaya and Rubinstein of Brown University found that at the federal level, "a rise in minimum wage have [sic] an instantaneous impact on wage rates and a corresponding negative impact on employment", stating, "Minimum wage increases boost teenage wage rates and reduce teenage employment." Another 2011 study by Sen, Rybczynski, and Van De Waal found that "a 10% increase in the minimum wage is significantly correlated with a 3−5% drop in teen employment." A 2012 study by Sabia, Hansen, and Burkhauser found that "minimum wage increases can have substantial adverse labor demand effects for low-skilled individuals", with the largest effects on those aged 16 to 24. A 2013 study by Meer and West concluded that "the minimum wage reduces net job growth, primarily through its effect on job creation by expanding establishments ... most pronounced for younger workers and in industries with a higher proportion of low-wage workers." This study by Meer and West was later critiqued for its trends of assumption in the context of narrowly defined low-wage groups. The authors replied to the critiques and released additional data which addressed the criticism of their methodology, but did not resolve the issue of whether their data showed a causal relationship. Another 2013 study by Suzana Laporšek of the University of Primorska, on youth unemployment in Europe claimed there was "a negative, statistically significant impact of minimum wage on youth employment." A 2013 study by labor economists Tony Fang and Carl Lin which studied minimum wages and employment in China, found that "minimum wage changes have significant adverse effects on employment in the Eastern and Central regions of China, and result in disemployment for females, young adults, and low-skilled workers". Several researchers have conducted statistical meta-analyses of the employment effects of the minimum wage. In 1995, Card and Krueger analyzed 14 earlier time-series studies on minimum wages and concluded that there was clear evidence of publication bias (in favor of studies that found a statistically significant negative employment effect). They point out that later studies, which had more data and lower standard errors, did not show the expected increase in t-statistic (almost all the studies had a t-statistic of about two, just above the level of statistical significance at the .05 level). Though a serious methodological indictment, opponents of the minimum wage largely ignored this issue; as Thomas Leonard noted, "The silence is fairly deafening." Minimum wage laws affect workers in most low-paid fields of employment and have usually been judged against the criterion of reducing poverty. Minimum wage laws receive less support from economists than from the general public. Despite decades of experience and economic research, debates about the costs and benefits of minimum wages continue today. Various groups have great ideological, political, financial, and emotional investments in issues surrounding minimum wage laws. For example, agencies that administer the laws have a vested interest in showing that "their" laws do not create unemployment, as do labor unions whose members' finances are protected by minimum wage laws. On the other side of the issue, low-wage employers such as restaurants finance the Employment Policies Institute, which has released numerous studies opposing the minimum wage. The presence of these powerful groups and factors means that the debate on the issue is not always based on dispassionate analysis. Additionally, it is extraordinarily difficult to separate the effects of minimum wage from all the other variables that affect employment. Positive impact on small business owners and industry. Removes financial stress and encourages education, resulting in better paying jobs. Increases incentives to take jobs, as opposed to other methods of transferring income to the poor that are not tied to employment (such as food subsidies for the poor or welfare payments for the unemployed). Stimulates consumption, by putting more money in the hands of low-income people who spend their entire paychecks. Hence increases circulation of money through the economy. Increased job growth and creation. Encourages efficiency and automation of industry. Removes low paying jobs, forcing workers to train for, and move to, higher paying jobs. Increases technological development. Costly technology that increases business efficiency is more appealing as the price of labor increases. Minimum wage alone is not effective at alleviating poverty, and in fact produces a net increase in poverty due to disemployment effects. As a labor market analogue of political-economic protectionism, it excludes low cost competitors from labor markets and hampers firms in reducing wage costs during trade downturns. This generates various industrial-economic inefficiencies. Reduces quantity demanded of workers, either through a reduction in the number of hours worked by individuals, or through a reduction in the number of jobs. May cause price inflation as businesses try to compensate by raising the prices of the goods being sold. Benefits some workers at the expense of the poorest and least productive. Encourages employers to replace low-skilled workers with computers, such as self-checkout machines. Can result in the exclusion of certain groups (ethnic, gender etc.) from the labor force. Small firms with limited payroll budgets cannot offer their most valuable employees fair and attractive wages above unskilled workers paid the artificially high minimum, and see a rising hurdle-cost of adding workers. Is less effective than other methods (e.g. the Earned Income Tax Credit) at reducing poverty, and is more damaging to businesses than those other methods. Discriminates against, through pricing out, less qualified workers (including newcomers to the labor market, e.g. young workers) by keeping them from accumulating work experience and qualifications, hence potentially graduating to higher wages later. Results in jobs moving to other areas or countries which allow lower-cost labor. Results in higher long-term unemployment. Forbidding employers to pay less than a legal minimum is equivalent to forbidding workers to sell their labor for less than the minimum wage. The legal restriction that employers cannot pay less than a legislated wage is equivalent to the legal restriction that workers cannot work at all in the protected sector unless they can find employers willing to hire them at that wage. In 2006, the International Labour Organization (ILO) argued that the minimum wage could not be directly linked to unemployment in countries that have suffered job losses. In April 2010, the Organisation for Economic Co-operation and Development (OECD) released a report arguing that countries could alleviate teen unemployment by "lowering the cost of employing low-skilled youth" through a sub-minimum training wage. A study of U.S. states showed that businesses' annual and average payrolls grow faster and employment grew at a faster rate in states with a minimum wage. The study showed a correlation, but did not claim to prove causation. Although strongly opposed by both the business community and the Conservative Party when introduced in the UK in 1999, the Conservatives reversed their opposition in 2000. Accounts differ as to the effects of the minimum wage. The Centre for Economic Performance found no discernible impact on employment levels from the wage increases, while the Low Pay Commission found that employers had reduced their rate of hiring and employee hours employed, and found ways to cause current workers to be more productive (especially service companies). The Institute for the Study of Labor found prices in the minimum wage sector rose significantly faster than prices in non-minimum wage sectors, in the four years following the implementation of the minimum wage. Neither trade unions nor employer organizations contest the minimum wage, although the latter had especially done so heavily until 1999. In 2014, supporters of minimum wage cited a study that found that job creation within the United States is faster in states that raised their minimum wages. In 2014, supporters of minimum wage cited news organizations who reported the state with the highest minimum-wage garnered more job creation than the rest of the United States. In 2014, in Seattle, Washington, liberal and progressive business owners who had supported the city's new $15 minimum wage said they might hold off on expanding their businesses and thus creating new jobs, due to the uncertain timescale of the wage increase implementation. However, subsequently at least two of the business owners quoted did expand. The dollar value of the minimum wage loses purchasing power over time due to inflation. Minimum wage laws, for instance proposals to index the minimum wage to average wages, have the potential to keep the dollar value of the minimum wage relevant and predictable. With regard to the economic effects of introducing minimum wage legislation in Germany in January 2015, recent developments have shown that the feared increase in unemployment has not materialized, however, in some economic sectors and regions of the country, it came to a decline in job opportunities particularly for temporary and part-time workers, and some low-wage jobs have disappeared entirely. Because of this overall positive development, the Deutsche Bundesbank revised its opinion, and ascertained that “the impact of the introduction of the minimum wage on the total volume of work appears to be very limited in the present business cycle”. According to a 1978 article in the American Economic Review, 90% of the economists surveyed agreed that the minimum wage increases unemployment among low-skilled workers. By 1992 the survey found 79% of economists in agreement with that statement, and by 2000, 46% were in full agreement with the statement and 28% agreed with provisos (74% total). The authors of the 2000 study also reweighted data from a 1990 sample to show that at that time 62% of academic economists agreed with the statement above, while 20% agreed with provisos and 18% disagreed. They state that the reduction on consensus on this question is "likely" due to the Card and Krueger research and subsequent debate. A similar survey in 2006 by Robert Whaples polled PhD members of the American Economic Association (AEA). Whaples found that 47% respondents wanted the minimum wage eliminated, 38% supported an increase, 14% wanted it kept at the current level, and 1% wanted it decreased. Another survey in 2007 conducted by the University of New Hampshire Survey Center found that 73% of labor economists surveyed in the United States believed 150% of the then-current minimum wage would result in employment losses and 68% believed a mandated minimum wage would cause an increase in hiring of workers with greater skills. 31% felt that no hiring changes would result. Surveys of labor economists have found a sharp split on the minimum wage. Fuchs et al. (1998) polled labor economists at the top 40 research universities in the United States on a variety of questions in the summer of 1996. Their 65 respondents were nearly evenly divided when asked if the minimum wage should be increased. They argued that the different policy views were not related to views on whether raising the minimum wage would reduce teen employment (the median economist said there would be a reduction of 1%), but on value differences such as income redistribution. Daniel B. Klein and Stewart Dompe conclude, on the basis of previous surveys, "the average level of support for the minimum wage is somewhat higher among labor economists than among AEA members." In 2007, Klein and Dompe conducted a non-anonymous survey of supporters of the minimum wage who had signed the "Raise the Minimum Wage" statement published by the Economic Policy Institute. 95 of the 605 signatories responded. They found that a majority signed on the grounds that it transferred income from employers to workers, or equalized bargaining power between them in the labor market. In addition, a majority considered disemployment to be a moderate potential drawback to the increase they supported. In 2013, a diverse group of 37 economics professors was surveyed on their view of the minimum wage's impact on employment. 34% of respondents agreed with the statement, "Raising the federal minimum wage to $9 per hour would make it noticeably harder for low-skilled workers to find employment." 32% disagreed and the remaining respondents were uncertain or had no opinion on the question. 47% agreed with the statement, "The distortionary costs of raising the federal minimum wage to $9 per hour and indexing it to inflation are sufficiently small compared with the benefits to low-skilled workers who can find employment that this would be a desirable policy", while 11% disagreed. Economists and other political commentators have proposed alternatives to the minimum wage. They argue that these alternatives may address the issue of poverty better than a minimum wage, as it would benefit a broader population of low wage earners, not cause any unemployment, and distribute the costs widely rather than concentrating it on employers of low wage workers. A basic income (or negative income tax) is a system of social security that periodically provides each citizen with a sum of money that is sufficient to live on frugally. It is argued that recipients of the basic income would have considerably more bargaining power when negotiating a wage with an employer as there would be no risk of destitution for not taking the employment. As a result, the jobseeker could spend more time looking for a more appropriate or satisfying job, or they could wait until a higher-paying job appeared. Alternatively, they could spend more time increasing their skills in university, which would make them more suitable for higher-paying jobs, as well as provide numerous other benefits. Experiments on Basic Income and NIT in Canada and the USA show that people spent more time studying while the program was running. Proponents argue that a basic income that is based on a broad tax base would be more economically efficient, as the minimum wage effectively imposes a high marginal tax on employers, causing losses in efficiency. A guaranteed minimum income is another proposed system of social welfare provision. It is similar to a basic income or negative income tax system, except that it is normally conditional and subject to a means test. Some proposals also stipulate a willingness to participate in the labor market, or a willingness to perform community services. A refundable tax credit is a mechanism whereby the tax system can reduce the tax owed by a household to below zero, and result in a net payment to the taxpayer beyond their own payments into the tax system. Examples of refundable tax credits include the earned income tax credit and the additional child tax credit in the US, and working tax credits and child tax credits in the UK. Such a system is slightly different from a negative income tax, in that the refundable tax credit is usually only paid to households that have earned at least some income. This policy is more targeted against poverty than the minimum wage, because it avoids subsidizing low-income workers who are supported by high-income households (for example, teenagers still living with their parents). In the United States, earned income tax credit rates, also known as EITC or EIC, vary by state—some are refundable while other states do not allow a refundable tax credit. The federal EITC program has been expanded by a number of presidents including Jimmy Carter, Ronald Reagan, George H.W. Bush, and Bill Clinton. In 1986, President Reagan described the EITC as "the best anti poverty, the best pro-family, the best job creation measure to come out of Congress." The ability of the earned income tax credit to deliver larger monetary benefits to the poor workers than an increase in the minimum wage and at a lower cost to society was documented in a 2007 report by the Congressional Budget Office. The Adam Smith Institute prefers cutting taxes on the poor and middle class instead of raising wages as an alternative to the minimum wage. Italy, Sweden, Norway, Finland, and Denmark are examples of developed nations where there is no minimum wage that is required by legislation. Such nations, particularly the Nordics, have very high union participation rates. Instead, minimum wage standards in different sectors are set by collective bargaining. Some economists such as Scott Sumner and Edmund Phelps advocate a wage subsidy program. A wage subsidy is a payment made by a government for work people do. It is based either on an hourly basis or by income earned. Advocates argue that the primary deficiencies of the EITC and the minimum wage are best avoided by a wage subsidy. However, the wage subsidy in the United States suffers from a lack of political support from either major political party. Providing education or funding apprenticeships or technical training can provide a bridge for low skilled workers to move into wages above a minimum wage. For example, Germany has adopted a state funded apprenticeship program that combines on-the-job and classroom training. Having more skills makes workers more valuable and more productive, but having a high minimum wage for low-skill jobs reduces the incentive to seek education and training. Moving some workers to higher-paying jobs will decrease the supply of workers willing to accept low-skill jobs, increasing the market wage for those low skilled jobs (assuming a stable labor market). However, in that solution the wage will still not increase above the marginal return for the role and will likely promote automation or business closure. In January 2014, seven Nobel economists—Kenneth Arrow, Peter Diamond, Eric Maskin, Thomas Schelling, Robert Solow, Michael Spence, and Joseph Stiglitz—and 600 other economists wrote a letter to the US Congress and the US President urging that, by 2016, the US government should raise the minimum wage to $10.10. They endorsed the Minimum Wage Fairness Act which was introduced by US Senator Tom Harkin in 2013. U.S. Senator Bernie Sanders introduced a bill in 2015 that would raise the minimum wage to $15, and in his 2016 campaign for president ran on a platform of increasing it. Although Sanders did not become the nominee, the Democratic National Committee adopted his $15 minimum wage push in their 2016 party platform. Reactions from former McDonald's USA Ed Rensi about raising minimum wage to $15 is to completely push humans out of the picture when it comes to labor if they are to pay minimum wage at $15 they would look into replacing humans with machines as that would be the more cost-effective than having employees that are ineffective. During an interview on FOX Business Network’s Mornings with Maria, he stated that he believes an increase to $15 an hour would cause job loss at an extraordinary level. Rensi also believes it does not only affect the fast food industry, franchising he sees as the best business model in the United States, it is dependent on people that have low job skills that have to grow and if you cannot pay them a reasonable wage then they are going to be replaced with machines. In late March 2016, Governor of California Jerry Brown reached a deal to raise the minimum wage to $15 by 2022 for big businesses and 2023 for smaller businesses. In contrast, the relatively high minimum wage in Puerto Rico has been blamed by various politicians and commentators as a highly significant factor in the Puerto Rican government-debt crisis. One study concluded that "Employers are disinclined to hire workers because the US federal minimum wage is very high relative to the local average". As of December 2014[update], unions were exempt from recent minimum wage increases in Chicago, Illinois, SeaTac, Washington, and Milwaukee County, Wisconsin, as well as the California cities of Los Angeles, San Francisco, Long Beach, San Jose, Richmond, and Oakland. ^ a b c "ILO 2006: Minimum wages policy (PDF)" (PDF). Ilo.org. Archived (PDF) from the original on 29 December 2009. Retrieved 1 March 2012. ^ Leonard, Thomas C. (2000). "The Very Idea of Apply Economics: The Modern Minimum-Wage Controversy and Its Antecedents". In Backhouse, Roger E.; Biddle, Jeff. Toward a History of Applied Economics. Durham: Duke University Press. pp. 117–144. ISBN 978-0-8223-6485-6. ^ a b Gwartney, James David; Clark, J. R.; Stroup, Richard L. (1985). Essentials of Economics. New York: Harcourt College Pub; 2 edition. p. 405. ISBN 978-0123110350. ^ "Should We Raise The Minimum Wage?". The Perspective. 30 August 2017. Retrieved 4 September 2017. ^ Burkhauser, Richard (30 September 2010). "Minimum Wages. by David Neumark and William L. Wascher". ILR Review. 64 (1). Archived from the original on 9 October 2013. ^ a b "The Young and the Jobless". The Wall Street Journal. 3 October 2009. Archived from the original on 11 January 2014. Retrieved 11 January 2014. ^ Black, John (18 September 2003). Oxford Dictionary of Economics. Oxford University Press. p. 300. ISBN 978-0-19-860767-0. ^ a b c Card, David; Krueger, Alan B. (1995). Myth and Measurement: The New Economics of the Minimum Wage. Princeton University Press. pp. 1, 6–7. ^ a b c d Mihm, Stephen (5 September 2013). "How the Black Death Spawned the Minimum Wage". Bloomberg View. Archived from the original on 18 April 2014. Retrieved 17 April 2014. ^ Thorpe, Vanessa (29 March 2014). "Black death was not spread by rat fleas, say researchers". The Guardian. Archived from the original on 30 March 2014. Retrieved 29 March 2014. ^ a b Starr, Gerald (1993). Minimum wage fixing : an international review of practices and problems (2nd impression (with corrections) ed.). Geneva: International Labour Office. p. 1. ISBN 9789221025115. ^ Nordlund, Willis J. (1997). The quest for a living wage : the history of the federal minimum wage program. Westport, Conn.: Greenwood Press. p. xv. ISBN 9780313264122. ^ a b c d Neumark, David; William L. Wascher (2008). Minimum Wages. Cambridge, Massachusetts: The MIT Press. ISBN 978-0-262-14102-4. Archived from the original on 28 April 2016. ^ "OECD Statistics (GDP, unemployment, income, population, labour, education, trade, finance, prices...)". Stats.oecd.org. Archived from the original on 21 April 2013. Retrieved 29 March 2013. ^ Grossman, Jonathan. "Fair Labor Standards Act of 1938: Maximum Struggle for a Minimum Wage". Department of Labor. Archived from the original on 16 April 2014. Retrieved 17 April 2014. ^ Stone, Jon (1 October 2010). "History of the UK's minimum wage". Total Politics. Archived from the original on 14 January 2014. Retrieved 17 April 2014. ^ Williams, Walter E. (June 2009). "The Best Anti-Poverty Program We Have?". Regulation. 32 (2): 62. ^ a b "Minimum wage statistics – Statistics Explained". ec.europa.eu. Archived from the original on 7 February 2016. Retrieved 12 February 2016. ^ a b Alderman, Liz; Greenhouse, Steven (27 October 2014). "Fast Food in Denmark Serves Something Atypical: Living Wages". The New York Times. Archived from the original on 28 October 2014. Retrieved 27 October 2014. ^ "Minimum Wage". Washington State Dept. of Labor & Industries. Archived from the original on 12 January 2015. Retrieved 18 January 2015. ^ "National Minimum Wage 2018". Retrieved 24 May 2018. ^ "Most Asked Questions about Minimum Wages in India". PayCheck.in. 22 February 2013. Archived from the original on 3 April 2013. Retrieved 29 March 2013. ^ a b c Sowell, Thomas (2004). "Minimum Wage Laws". Basic Economics: A Citizen's Guide to the Economy. New York: Basic Books. pp. 163–69. ISBN 978-0-465-08145-5. ^ Setting the Initial Statutory Minimum Wage Rate, submission to government by the Hong Kong General Chamber of Commerce. ^ Editorial Board (9 February 2014). "The Case for a Higher Minimum Wage". The New York Times. Archived from the original on 9 February 2014. Retrieved 9 February 2014. ^ Chumley, Cheryl K. (18 March 2013). "Take it to the bank: Sen. Elizabeth Warren wants to raise minimum wage to $22 per hour". Washington Times. Archived from the original on 23 February 2014. Retrieved 22 January 2014. ^ Wing, Nick (18 March 2013). "Elizabeth Warren: Minimum Wage Would Be $22 An Hour If It Had Kept Up With Productivity". Huffington Post. Archived from the original on 3 February 2014. Retrieved 22 January 2014. ^ Hart-Landsberg, Ph.D., Martin (19 December 2013). "$22.62/HR: The Minimum Wage If It Had Risen Like The Incomes Of The 1%". thesocietypages.org. Archived from the original on 16 January 2014. Retrieved 22 January 2014. ^ Rmusemore (3 December 2013). "Stop Complaining Republicans, the Minimum Wage Should be $22.62 an Hour". policususa.com. Archived from the original on 4 December 2013. Retrieved 22 January 2014. ^ McConnell, C. R.; Brue, S. L. (1999). Economics (14th ed.). Irwin-McGraw Hill. p. 594. ^ Gwartney, J. D.; Stroup, R. L.; Sobel, R. S.; Macpherson, D. A. (2003). Economics: Private and Public Choice (10th ed.). Thomson South-Western. p. 97. ^ Mankiw, N. Gregory (2011). Principles of Macroeconomics (6th ed.). South-Western Pub. p. 311. ^ Boal, William M.; Ransom, Michael R (March 1997). "Monopsony in the Labor Market". Journal of Economic Literature. 35 (1): 86–112. JSTOR 2729694. ^ Rittenberg, Timothy Tregarthen, Libby (1999). Economics (2nd ed.). New York: Worth Publishers. p. 290. ISBN 9781572594180. Retrieved 21 June 2014. ^ Garegnani, P. (July 1970). "Heterogeneous Capital, the Production Function and the Theory of Distribution". The Review of Economic Studies. 37 (3): 407–36. doi:10.2307/2296729. JSTOR 2296729. ^ Vienneau, Robert L. (2005). "On Labour Demand and Equilibria of the Firm". The Manchester School. 73 (5): 612–19. doi:10.1111/j.1467-9957.2005.00467.x. ^ Opocher, A.; Steedman, I. (2009). "Input price-input quantity relations and the numeraire". Cambridge Journal of Economics. 33 (5): 937–48. doi:10.1093/cje/bep005. ^ Anyadike-Danes, Michael; Godley, Wynne (1989). "Real Wages and Employment: A Sceptical View of Some Recent Empirical Work". The Manchester School. 57 (2): 172–87. doi:10.1111/j.1467-9957.1989.tb00809.x. ^ White, Graham (November 2001). "The Poverty of Conventional Economic Wisdom and the Search for Alternative Economic and Social Policies". The Drawing Board: An Australian Review of Public Affairs. 2 (2): 67–87. Archived from the original on 24 May 2013. ^ OECD. "Minimum relative to average wages of full-time workers". Archived from the original on 2 May 2014. ^ Fields, Gary S. (1994). "The Unemployment Effects of Minimum Wages". International Journal of Manpower. 15 (2): 74–81. doi:10.1108/01437729410059323. ^ Gillespie, Andrew (2007). Foundations of Economics. Oxford University Press. p. 240. ^ Krugman, Paul (2013). Economics. Worth Publishers. p. 385. ^ Blinder, Alan S. (23 May 1996). "The $5.15 Question". The New York Times. p. A29. Archived from the original on 1 July 2017. ^ Schmitt, John (February 2013). "Why Does the Minimum Wage Have No Discernible Effect on Employment?" (PDF). Center for Economic and Policy Research. Archived (PDF) from the original on 3 December 2013. Retrieved 5 December 2013. Lay summary – The Washington Post (14 February 2013). ^ Gramlich, Edward M.; Flanagan, Robert J.; Wachter, Michael L. (1976). "Impact of Minimum Wages on Other Wages, Employment, and Family Incomes". Brookings Papers on Economic Activity. 1976 (2): 409–61. doi:10.2307/2534380. JSTOR 2534380. ^ Brown, Charles; Gilroy, Curtis; Kohen, Andrew (Winter 1983). "Time-Series Evidence of the Effect of the Minimum Wage on Youth Employment and Unemployment". The Journal of Human Resources. 18 (1): 3–31. doi:10.2307/145654. JSTOR 145654. ^ Wellington, Alison J. (Winter 1991). "Effects of the Minimum Wage on the Employment Status of Youths: An Update". The Journal of Human Resources. 26 (1): 27–46. doi:10.2307/145715. JSTOR 145715. ^ Fox, Liana (24 October 2006). "Minimum wage trends: Understanding past and contemporary research". Economic Policy Institute. Archived from the original on 16 December 2008. Retrieved 6 December 2013. ^ "The Florida Minimum Wage: Good for Workers, Good for the Economy" (PDF). Archived from the original (PDF) on 22 June 2013. Retrieved 3 November 2013. ^ Acemoglu, Daron; Pischke, Jörn-Steffen (November 2001). "Minimum Wages and On-the-Job Training" (PDF). Institute for the Study of Labor. SSRN 288292. Archived (PDF) from the original on 25 May 2017. Retrieved 6 December 2013. Also published as Acemoglu, Daron; Pischke, Jörn-Steffen (2003). "Minimum Wages and On-the-job Training". In Polachek, Solomon W. Worker Well-Being and Public Policy. Research in Labor Economics. 22. pp. 159–202. doi:10.1016/S0147-9121(03)22005-7. hdl:1721.1/63851. ISBN 978-0-76231-026-5. ^ Sabia, Joseph J.; Nielsen, Robert B. (2012). Can Raising the Minimum Wage Reduce Poverty and Hardship? (PDF). Employment Policies Institute. p. 4. Archived (PDF) from the original on 8 January 2017. ^ Michael Reich. "Increasing the Minimum Wage in San Jose: Benefits and Costs- White Paper" (PDF). Archived (PDF) from the original on 4 April 2013. Retrieved 29 March 2013. ^ "The logical floor". The Economist. 14 December 2013. Archived from the original on 1 August 2017 – via The Economist. ^ Eidelson, Josh (6 September 2018). "Higher Minimum Wage Boosts Pay Without Reducing Jobs, Study Says". Bloomberg. Retrieved 20 September 2018. ^ Michael Hiltzik (19 May 2017). "Minimum wage increases can kill businesses — if they already stink". The Los Angeles Times. ^ a b Card, David; Krueger, Alan B. (September 1994). "Minimum Wages and Employment: A Case Study of the Fast-Food Industry in New Jersey and Pennsylvania". The American Economic Review. 84 (4): 772–93. JSTOR 2118030. ^ Card; Krueger (2000). "Minimum Wages and Employment: A Case Study of the Fast-Food Industry in New Jersey and Pennsylvania: Reply". American Economic Review. 90 (5): 1397–420. doi:10.1257/aer.90.5.1397. ^ Dube, Arindrajit; Lester, T. William; Reich, Michael (November 2010). "Minimum Wage Effects Across State Borders: Estimates Using Contiguous Counties". Review of Economics and Statistics. 92 (4): 945–64. CiteSeerX 10.1.1.372.5805. doi:10.1162/REST_a_00039. Retrieved 10 March 2014. ^ Schmitt, John (1 January 1996). "The Minimum Wage and Job Loss". Economic Policy Institute. Archived from the original on 29 March 2014. Retrieved 7 December 2013. ^ Neumark, David; Wascher, William (December 2000). "Minimum Wages and Employment: A Case Study of the Fast-Food Industry in New Jersey and Pennsylvania: Comment". The American Economic Review. 90 (5): 1362–96. doi:10.1257/aer.90.5.1362. JSTOR 2677855. ^ Ropponen, Olli (2011). "Reconciling the evidence of Card and Krueger (1994) and Neumark and Wascher (2000)". Journal of Applied Econometrics. 26 (6): 1051–57. doi:10.1002/jae.1258. hdl:10138/26140. ^ "Revisiting the Minimum Wage—Employment Debate: Throwing Out the Baby with the Bathwater?" by David Neumark, J. M. Ian Salas, William Wascher. Published in ILR Review. Vol 67, Issue 3_suppl, 2014. URL: Neumark, David; Salas, J. M. Ian; Wascher, William (2014). "Archived copy". ILR Review. 67 (3_suppl): 608–648. doi:10.1177/00197939140670S307. hdl:10419/69384. .
^ Hoffman, Saul D; Trace, Diane M (2009). "NJ and PA Once Again: What Happened to Employment when the PA–NJ Minimum Wage Differential Disappeared?". Eastern Economic Journal. 35 (1): 115–28. doi:10.1057/eej.2008.1. ^ a b Dube, Arindrajit; Lester, T. William; Reich, Michael (November 2010). "Minimum Wage Effects Across State Borders: Estimates Using Contiguous Counties" (PDF). The Review of Economics and Statistics. 92 (4): 945–64. CiteSeerX 10.1.1.372.5805. doi:10.1162/REST_a_00039. Archived (PDF) from the original on 12 January 2013. ^ Folbre, Nancy (1 November 2010). "Along the Minimum-Wage Battle Front". New York Times. Archived from the original on 4 December 2013. Retrieved 4 December 2013. ^ "Using Federal Minimum Wages to Identify the Impact of Minimum Wages on Employment and Earnings Across the U.S. States" (PDF). 1 October 2011. ^ "Teen employment, poverty, and the minimum wage: Evidence from Canada". 1 January 2011. Archived from the original on 16 September 2015. ^ "Are the Effects of Minimum Wage Increases Always Small? New Evidence from a Case Study of New York State". 2 April 2012. Archived from the original on 26 September 2015. ^ a b Meer, Jonathan; West, Jeremy (2016). 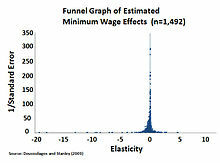 "Effects of the Minimum Wage on Employment Dynamics". Journal of Human Resources. 51 (2): 500–522. CiteSeerX 10.1.1.705.3838. doi:10.3368/jhr.51.2.0414-6298R1. ^ Dube, Arindrajit (26 October 2013). "Minimum Wages and Aggregate Job Growth: Causal Effect or Statistical Artifact?". Rochester, NY. ^ Schmitt, John. "More on Meer and West's Minimum Wage Study". Archived from the original on 26 October 2014. ^ "Minimum wage effects on youth employment in the European Union". 14 September 2013. Archived from the original on 16 October 2015. ^ "Minimum Wages and Employment in China". 14 December 2013. Archived from the original on 18 September 2015. ^ Fang, Tony; Lin, Carl (27 November 2015). "Minimum wages and employment in China". IZA Journal of Labor Policy. 4 (1): 22. doi:10.1186/s40173-015-0050-9. ISSN 2193-9004. ^ Card, David; Krueger, Alan B. (May 1995). "Time-Series Minimum-Wage Studies: A Meta-analysis". The American Economic Review. 85 (2): 238–43. JSTOR 2117925. ^ Leonard, T. C. (2000). "The Very Idea of Applying Economics: The Modern Minimum-Wage Controversy and Its Antecedents" (PDF). History of Political Economy. 32: 117. CiteSeerX 10.1.1.422.8197. doi:10.1215/00182702-32-Suppl_1-117. Archived (PDF) from the original on 17 November 2017. ^ Stanley, T. D. (2005). "Beyond Publication Bias". Journal of Economic Surveys. 19 (3): 309. doi:10.1111/j.0950-0804.2005.00250.x. ^ Doucouliagos, Hristos; Stanley, T. D. (2009). "Publication Selection Bias in Minimum-Wage Research? A Meta-Regression Analysis". British Journal of Industrial Relations. 47 (2): 406–28. doi:10.1111/j.1467-8543.2009.00723.x. ^ "Does the UK Minimum Wage Reduce Employment? A Meta-Regression Analysis" Archived 2 August 2017 at the Wayback Machine.y Megan de Linde Leonard, T. D. Stanley, and Hristos Doucouliagos. BJIR. vol. 52, iss. 3, September 2014, pp. 499–520. doi:10.1111/bjir.12031. ^ D. Neumark and W.L. Wascher, Minimum Wages and Employment, Foundations and Trends in Microeconomics, vol. 3, no. 1+2, pp 1-182, 2007. http://www.nber.org/papers/w12663.pdf. ^ a b Eatwell, John, Ed. ; Murray Milgate; Peter Newman (1987). The New Palgrave: A Dictionary of Economics. London: The Macmillan Press Limited. pp. 476–78. ISBN 978-0-333-37235-7. ^ Bernstein, Harry (15 September 1992). "Troubling Facts on Employment". Los Angeles Times. p. D3. Archived from the original on 17 December 2013. Retrieved 6 December 2013. ^ Engquist, Erik (May 2006). "Health bill fight nears showdown". Crain's New York Business. 22 (20): 1. ^ "Holly Sklar, Small Businesses Want Minimum Wage Increase – Business For a Fair Minimum Wage". St. Louis Post Dispatch. Archived from the original on 17 January 2015. ^ "Raising the minimum wage could improve public health". Archived from the original on 9 August 2016. ^ Sutch, Richard (September 2010). "The Unexpected Long-Run Impact of the Minimum Wage: An Educational Cascade". NBER Working Paper No. 16355. doi:10.3386/w16355. ^ a b c d "Real Value of the Minimum Wage". Epi.org. Archived from the original on 19 February 2013. Retrieved 29 March 2013. ^ Freeman, Richard B. (1994). "Minimum Wages – Again!". International Journal of Manpower. 15 (2): 8–25. doi:10.1108/01437729410059305. ^ a b c Wolcott, Ben. "2014 Job Creation Faster in States that Raised the Minimum Wage". Archived from the original on 20 October 2014. ^ Bernard Semmel, Imperialism and Social Reform: English Social-Imperial Thought 1895–1914 (London: Allen and Unwin, 1960), p. 63. ^ "ITIF Report Shows Self-service Technology a New Force in Economic Life". The Information Technology & Innovation Foundation. 14 April 2010. Archived from the original on 19 January 2012. Retrieved 5 October 2011. ^ Alesina, Alberto F.; Zeira, Joseph (2006). "Technology and Labor Regulations". CiteSeerX 10.1.1.710.9997. doi:10.2139/ssrn.936346. ^ "Minimum Wages in canada : theory, evidence and policy". Hrsdc.gc.ca. 7 March 2008. Archived from the original on 2 April 2012. Retrieved 5 October 2011. ^ Kallem, Andrew (2004). "Youth Crime and the Minimum Wage". doi:10.2139/ssrn.545382. ^ "Crime and work: What we can learn from the low-wage labor market | Economic Policy Institute". Epi.org. 1 July 2000. Archived from the original on 1 July 2011. Retrieved 5 October 2011. ^ Kosteas, Vasilios D. "Minimum Wage." Encyclopedia of World Poverty. Ed. M. Odekon.Thousand Oaks, CA: Sage Publications, Inc., 2006. 719-21. SAGE knowledge. Web. ^ a b Llewellyn H. Rockwell Jr. (28 October 2005). "Wal-Mart Warms to the State". Mises.org. Mises Institute. Archived from the original on 8 May 2009. Retrieved 5 October 2011. ^ "The Wages of Politics". Wall Street Journal. 11 November 2006. Archived from the original on 10 December 2013. Retrieved 6 December 2013. ^ Messmore, Ryan. "Increasing the Mandated Minimum Wage: Who Pays the Price?". Heritage.org. Archived from the original on 28 November 2009. Retrieved 5 October 2011. ^ Art Carden (4 November 2006). "Why Wal-Mart Matters". Mises.org. Mises Institute. Archived from the original on 11 April 2009. Retrieved 5 October 2011. ^ Belvedere, Matthew (20 May 2016). "Worker pay vs automation tipping point may be coming, says this fast-food CEO". CNBC. Archived from the original on 23 December 2016. Retrieved 22 December 2016. ^ Hashimoto, Masanori (1987). "The Minimum Wage Law and Youth Crimes: Time-Series Evidence". The Journal of Law & Economics. 30 (2): 443–464. doi:10.1086/467144. JSTOR 725504. ^ Williams, Walter (1989). South Africa's War Against Capitalism. New York: Praeger. ISBN 978-0-275-93179-7. ^ Partridge, M. D.; Partridge, J. S. (1999). "Do minimum wage hikes reduce employment? State-level evidence from the low-wage retail sector". Journal of Labor Research. 20 (3): 393. doi:10.1007/s12122-999-1007-9. ^ "The Effects of a Minimum-Wage Increase on Employment and Family Income". 18 February 2014. Archived from the original on 25 July 2014. Retrieved 26 July 2014. ^ Covert, Bryce (21 February 2014). "A $10.10 Minimum Wage Would Make A DVD At Walmart Cost One Cent More". Archived from the original on 29 July 2014. ^ Hoium, Travis (19 October 2016). "What Will a Minimum Wage Increase Cost You at McDonald's?". The Motley Fool. Archived from the original on 23 July 2014. ^ Fiscal Policy Institute, "States with Minimum Wages Above the Federal Level have had Faster Small Business and Retail Job Growth," 30 March 2006. ^ "National Minimum Wage". politics.co.uk. Archived from the original on 1 December 2007. Retrieved 29 December 2007. ^ Metcalf, David (April 2007). "Why Has the British National Minimum Wage Had Little or No Impact on Employment?". Archived from the original on 21 September 2015. ^ Wadsworth, Jonathan (September 2009). "Did the National Minimum Wage Affect UK Prices" (PDF). ^ "States That Raised Minimum Wage See Faster Job Growth, Report Says". Archived from the original on 25 October 2014. ^ Rugaber, Christopher S. (19 July 2014). "States with higher minimum wage gain more jobs". USA Today. Archived from the original on 11 July 2017. ^ Stilwell, Victoria (8 March 2014). "Highest Minimum-Wage State Washington Beats U.S. in Job Creation". Bloomberg. Archived from the original on 10 January 2015. ^ Lobosco, Katie (14 May 2014). "Washington state defies minimum wage logic". CNN. Archived from the original on 25 October 2014. ^ "Did Washington State's Minimum Wage Bet Pay Off?". 5 March 2014. Archived from the original on 20 November 2014. ^ Meyerson, Harold (21 May 2014). "Harold Meyerson: A higher minimum wage may actually boost job creation". The Washington Post. Archived from the original on 18 July 2017. ^ Covert, Bryce (3 July 2014). "States That Raised Their Minimum Wages Are Experiencing Faster Job Growth". Archived from the original on 25 October 2014. ^ Nellis, Mike. "Minimum Wage Question and Answer". Archived from the original on 25 October 2014. ^ C. Eisenring (Dec 2015). Gefährliche Mindestlohn-Euphorie Archived 1 January 2016 at the Wayback Machine (in German). Neue Zürcher Zeitung. Retrieved 30 December 2015. ^ R. Janssen (Sept 2015). The German Minimum Wage Is Not A Job Killer Archived 9 November 2015 at the Wayback Machine. Social Europe. Retrieved 30 December 2015. ^ Kearl, J. R.; Pope, Clayne L.; Whiting, Gordon C.; Wimmer, Larry T. (May 1979). "A Confusion of Economists?". The American Economic Review. 69 (2): 28–37. JSTOR 1801612. ^ Alston, Richard M.; Kearl, J. R.; Vaughan, Michael B. (May 1992). "Is There a Consensus Among Economists in 1990s?". The American Economic Review. 82 (2): 203–09. JSTOR 2117401. ^ Hall, Robert Ernest (2007). Economics: Principles and Applications. Centage Learning. ISBN 978-1111798208. ^ Fuller, Dan; Geide-Stevenson, Doris (2003). "Consensus Among Economists: Revisited". Journal of Economic Education. 34 (4): 369–87. doi:10.1080/00220480309595230. ^ Whaples, Robert (2006). "Do Economists Agree on Anything? Yes!". The Economists' Voice. 3 (9): 1–6. doi:10.2202/1553-3832.1156. ^ Fuchs, Victor R.; Krueger, Alan B.; Poterba, James M. (September 1998). "Economists' Views about Parameters, Values, and Policies: Survey Results in Labor and Public Economics". Journal of Economic Literature. 36 (3): 1387–425. JSTOR 2564804. ^ a b Klein, Daniel; Dompe, Stewart (January 2007). "Reasons for Supporting the Minimum Wage: Asking Signatories of the 'Raise the Minimum Wage' Statement". Economics in Practice. 4 (1): 125–67. Archived from the original on 13 December 2011. ^ "Minimum Wage". IGM Forum. 26 February 2013. Archived from the original on 21 August 2013. Retrieved 6 December 2013. ^ http://monkeydo.biz, Designed & Developed by Monkey Do, LLC. "EconoMonitor". Archived from the original on 23 September 2014. ^ "Suggestion: Raise welfare children in institutions". Star-News. 28 January 1972. Retrieved 19 November 2013. ^ David Scharfenberg (28 April 2014). "What The Research Says In The Minimum Wage Debate". WBUR. ^ "50 State Resources Map on State EITCs". The Hatcher Group. Archived from the original on 23 April 2009. Retrieved 16 June 2010. ^ "New Research Findings on the Effects of the Earned Income Tax Credit". Center on Budget and Policy Priorities. Archived from the original on 17 June 2010. Retrieved 30 June 2010. ^ Furman, Jason (10 April 2006). "Tax Reform and Poverty". Center on Budget and Policy Priorities. Archived from the original on 13 December 2013. Retrieved 7 December 2013. ^ "Response to a Request by Senator Grassley About the Effects of Increasing the Federal Minimum Wage Versus Expanding the Earned Income Tax Credit" (PDF). Congressional Budget Office. 9 January 2007. Archived (PDF) from the original on 31 July 2008. Retrieved 25 July 2008. ^ Olson, Parmy (9/01/2009). The Best Minimum Wages In Europe Archived 29 July 2017 at the Wayback Machine. Forbes. Retrieved 21 February 2014. ^ "Labor Criticizes". Lewiston Morning Tribune. Associated Press. 2 March 1933. pp. 1, 6. ^ Sumner, Scott. "TheMoneyIllusion " You can't redistribute income ." www.themoneyillusion.com. Archived from the original on 11 August 2017. Retrieved 11 August 2017. ^ Phelps, Edmund S. "Low-wage employment subsidies versus the welfare state." The American Economic Review 84.2 (1994): 54-58. ^ "The Wage Subsidy: A Better Way to Help the Poor | Manhattan Institute". Manhattan Institute. 25 September 2015. Archived from the original on 11 August 2017. Retrieved 11 August 2017. ^ Cass, Oren (19 August 2015). "A Better Wage Hike". US NEWS. Archived from the original on 20 August 2015. Retrieved 11 August 2017. ^ Smith, Noah (7 December 2013). "Noahpinion: Wage subsidies". Noahpinion. Archived from the original on 11 August 2017. Retrieved 11 August 2017. ^ Drum, Kevin (3 December 2013). "Wage subsidies might be a good idea, but Republicans will never support it". Mother Jones. Archived from the original on 11 August 2017. Retrieved 11 August 2017. ^ "Sanders Introduces Bill for $15-an-Hour Minimum Wage". Sen. Bernie Sanders. Archived from the original on 6 September 2015. Retrieved 15 September 2015. ^ Alex Seitz-Wald, Democrats Advance Most Progressive Platform in Party History Archived 1 August 2016 at the Wayback Machine, NBC News (10 July 2016). ^ Limitone, Julia (24 May 2016). "Fmr. Mcdonald's Usa Ceo: $35k Robots Cheaper Than Hiring At $15 Per Hour". Archived from the original on 13 July 2016. ^ Memo to the Fight for $15: Puerto Rico Happens with a Too High Minimum Wage Archived 7 November 2017 at the Wayback Machine Tim Worstall, Forbes.com, 3 July 2015. ^ a b "Minimum wages relative to median wages". www.oecd-ilibrary.org. Retrieved 2019-03-21. Burkhauser, R. V. (2014). Why minimum wage increases are a poor way to help the working poor (No. 86). IZA Policy Paper, Institute for the Study of Labor (IZA). Wikimedia Commons has media related to Minimum wage. A $15 U.S. Minimum Wage: How the Fast-Food Industry Could Adjust Without Shedding Jobs from the Political Economy Research Institute, January 2015.